Ivar Ballangrud's feat of winning seven Olympic medals - including four gold - is an enormous achievement by anyone's standards and in normal circumstances would have made his name instantly recognisable to sports fans throughout the world. That it has not become so is partly due to the extraordinary achievements of a contemporary of his - the great figure skater Sonja Henie. Although both these great athletes were Norwegian it is Henie's name that burns brightest in the damp eyes of old-timers and in the imaginations of the nation's youngsters. Henie is a huge name in winter sports, winning the women's figure skating title three times in a row from 1928 to 1936. Mind you, Ballangrud was no pushover. Take the Lake Placid games in 1932 where, after a bizarre rule change by the Americans introduced group starts instead of the traditional two man heats, Ballangrud saved Europe's honour by taking silver in the 10,000m race. The rule changes had disgusted several star European competitors like the great Finn Clas Thunberg, and they protested by withdrawing entirely from the competition, leaving the field clear for a North American rout. Only Ballangrud and his compatriot Bernt Evensen, who won the silver in the 500m, were able to stem the tide as the Americans and Canadians snatched 10 out of 12 medals on offer. 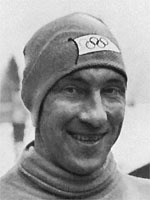 Ballangrud had made an excellent start to his Olympic career by winning gold in the 5000 metres and a well-deserved bronze in the 1500 metres behind Thunberg and Evensen at St. Moritz in 1928. Patience and hard work paid off in 1936 at Garmisch-Partenkirchen in Germany where Adolf Hitler was in attendance. A hot favourite, Ballangrud opened his account with victory in the 500 metres race and grabbed second place in the 1500 metres. More gold came his way in the 5000 metres and in the 10,000m race he held off his biggest rival Birger Vasenius of Finland to add another. Three Olympic Games, seven medals, five world records, Ballangrud remains a giant in Norwegian sport.